We're only four weeks until spring training, give or take. Pitchers and catchers begin reporting to spring training camps across Arizona and Florida about a month from now. Cactus League and Grapefruit League games are less than six weeks away. At the moment 20 of our top 50 free agents remain unsigned, including four of the top seven. There is still some time to go until spring training, for sure, but usually all the top free agents are signed by now. Anyway, we're going to keep track of the day's hot stove rumblings right here in this roundup post. Make sure you check back often for updates. It should go without saying that such a scenario seems like a long shot, but here we'll say it anyway: such a scenario seems like a long shot. Kluber's odds of being moved have been reduced by Cleveland clearing budget space through other means. That isn't to say Kluber is a lock to stay in Cleveland for long -- they're certain to continue gauging what his final three years of team control are worth -- just that he's more likely to begin the season with Cleveland than he was in November. At the same time, even if Cleveland were OK with moving Kluber the Reds would still have to consent to shedding Senzel while the Padres would have to part with serious prospect power in order to satisfy all the involved parties. Again, it's a fun hypothetical to think about. Just not one that seems likely to get done. Phillies shifting from Machado to Harper? 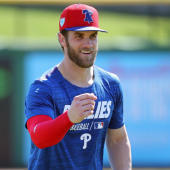 Because their weekend meeting with Bryce Harper went so well, the Phillies might be shifting their focus from Manny Machado to Harper, reports MLB.com's Todd Zolecki. It is unknown whether Philadelphia made Harper a formal contract offer at (or since) the meeting. The same front office and ownership group members who met with Machado at Citizens Bank Park last month met with Harper in Las Vegas over the weekend, according to Zolecki. On one hand, this could be nothing more than an attempt to pressure Machado into making a decision. "If you don't sign soon, we're going to go after Harper instead." That sort of thing. On the other hand, the Phillies have been planning for this offseason for a while, and they seem fairly desperate to land at least one of Machado or Harper. If there is any sense Machado doesn't want to go to Philadelphia, the Phillies could shift gears and act quickly to get Harper signed before interest picks up. White Sox haven't upped offer to Machado? Despite reports the White Sox offered Manny Machado eight years, Bruce Levine of 670 The Score says Chicago has not yet budged from its maximum offer of seven years. The average annual value of their offer is likely between $25 million and $30 million, Levine says, meaning the total contract would be seven years and $175 million to $210 million. That is a tad more than Chris Davis money (seven years, $161 million). In other Machado news, SNY's Andy Martino reports Machado has no intention of taking a discount to join the Yankees or any other team. He is going to the highest bidder. That is in no way surprising. Most free agents take the largest offer. The Yankees have indicated they will not get into a bidding war for Machado and will only sign him on their terms. If true, they won't get him. That puts the White Sox and Phillies in the best position to land him. The Giants have re-signed left-hander Derek Holland, reports Ken Rosenthal of The Athletic. He gets a one-year contract worth $7 million with a club option for 2020. Holland was a popular free agent target for teams looking for low-cost pitching depth this offseason. The Mets, Rangers, and Reds were all said to be after him, and at one point it was reported he could land a multiyear contract. That didn't happen, obviously. Holland, 32, revived his career with the Giants in 2018, throwing 171 1/3 innings with a 3.57 ERA in 30 starts and six relief appearances. From 2015-17, he had a 5.50 ERA in 301 innings around some injury problems. Holland is expected to join Madison Bumgarner, Jeff Samardzija, and Dereck Rodriguez in San Francisco's rotation this coming season. The fifth spot could go to Tyler Beede, Ty Blach, Chris Stratton, or Andrew Suarez. Johnny Cueto will miss 2019 while rehabbing from Tommy John surgery. Trade talks involving Sonny Gray are beginning to "ramp up," reports Jon Heyman of Fancred. Yankees GM Brian Cashman said the team had slowed trade talks following CC Sabathia's heart procedure just to make sure they had enough rotation depth. Sabathia was cleared to resume baseball activities last week and the Yankees have apparently rekindled trade talks. The Athletics, Braves, Brewers, Mariners, and Padres are among the interested teams. Gray, 29, threw 130 1/3 innings with a 4.90 ERA in 23 starts and seven relief appearances for New York last year. Interestingly enough, Gray had a 6.98 ERA in 59 1/3 innings at Yankee Stadium and a 3.17 ERA in 71 innings on the road in 2018. His track record with the A's was quite strong, so interested teams likely see Gray as someone who could thrive away from New York. He's a potential buy-low candidate, basically. Gray will be a free agent next offseason. According to Rick Hummel of the St. Louis Post-Dispatch, the Cardinals do not have any long-term contract extension talks scheduled with outfielder Marcell Ozuna or right-hander Michael Wacha. Both players agreed to one-year contracts for 2019 prior to last week's arbitration salary filing deadline. Ozuna and Wacha are both due to become free agents next offseason. The 28-year-old Ozuna authored a solid but unspectacular .280/.325/.433 batting line with 23 home runs last year, his first with St. Louis. It was his third good but not great season within the last four years. Only his monster 2017 campaign stands out. Wacha, 27, had a 3.20 ERA in 84 1/3 innings before an oblique strain ended his season in June. Wacha struggled with injuries and poor performance in 2016 and 2017. Last year he looked to be back to his 2013-15 form. The Rangers remain in contact with free agent relievers Cody Allen, Adam Ottavino, and Adam Warren, according to The Athletic's Ken Rosenthal. Texas is more likely to spread the money around and sign lower cost relievers as well as an infielder to replace the retired Adrian Beltre and the traded Jurickson Profar. The Rangers are early in their rebuild and signing veteran relievers to short-term contracts, then flipping them for prospects at the trade deadline, is a signature move for rebuilding clubs. Allen, Ottavino, and Warren represent three different types of relief pitchers. Ottavino is the big name who is among the top relievers in the game. Allen is a bounce-back candidate following a miserable 2018. He's someone you sign at a discount now and hope he returns to his pre-2018 form. Warren is a solid second- or third-tier free agent reliever who won't get much money, but will be quite useful to his next team. It sounds as though the Rangers will shoot a little lower, however. The Rays have added another right-handed bat to their collection Monday, as they reportedly reached an agreement with outfielder Avisail Garcia. The deal is for one year and $3.5 million, according to The Athletic's Ken Rosenthal. As @JimBowdenGM said, Avisail Garcia deal with #Rays, when completed, will be one year, $3.5M. Garcia, 27, was non-tendered by the White Sox after he failed to live up to his All-Star campaign in 2017. He hit .236/.281/.438 (96 OPS+) in 93 games, homering 19 times along the way. Garcia has been a better hitter against lefties than righties throughout his career.